Recipe/idea pretty much lifted directly from Thomas Keller's Bouchon cookbook. I'll be honest and say that this is a book maybe better for ideas than actual recipes (at least for me). He provides a dizzying list of specific steps. It's much in the style of Julia Child's work. This certainly helps you if you need exact procedures, but for those of us who just need the outline, the paragraphs of reading can become maddening. 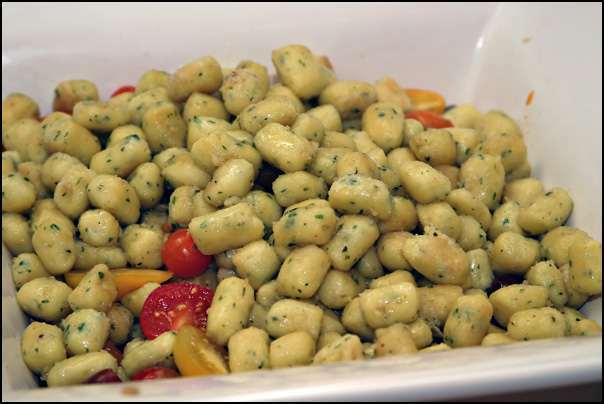 These "Gnocci" are actually a French variant on the traditional Italian Dish. Instead of potato, they are made from a Pate a Choux. The flavorings are some fresh herbs, mustard, and cheese. The pate a choux is then piped out into boiling water, with each gnocci being sliced off with a knife. This procedure is a bit difficult to do, pretty much impossible unless you have a helper. anne lended a hand, and we were able to tear through 480 gnocci (more or less) very quickly. It certainly is much faster than forming each by hand and pressing against the back of a fork (as one does with Italian Gnocci). Once the gnocci have been boiled until just done, they are placed on a sheet pan to cool and tossed with a bit of oil to avoid sticking. 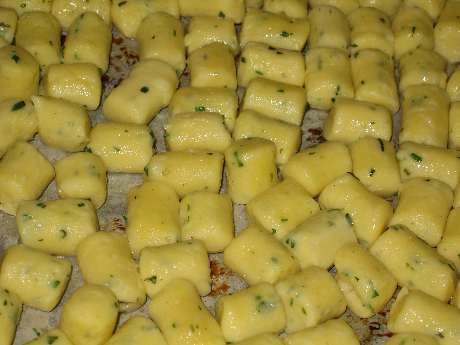 The sheet pan is placed into the freezer, and finally the completely frozen gnocci are put into zip to bags. 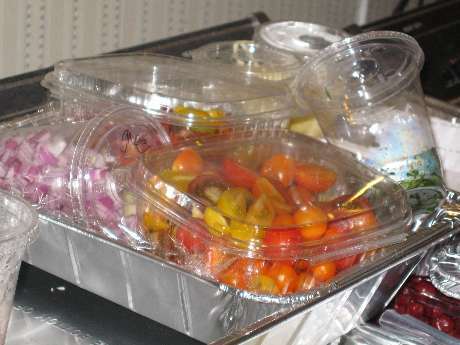 We ended up with two entire half-sheet pans, which when frozen ended up filling two gallon zip-top bags. Remember: we're feeding 40 people here. Preparation for the party involved thawing the gnocci in full sized hotel pans. The additional prep was some summer squash, red onion, and mini heirloom tomatoes. Final garnish was some thin sliced fresh basil. Once again, fully made ready well in advance of service. 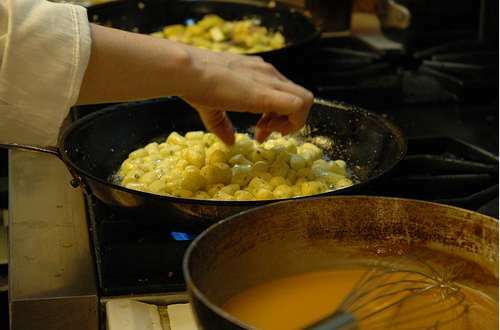 Here you see the gnocci being re-heated (by an off camera meriko) in clarified butter, just until they beging to re-puff and take on a bit of color. The summer squash and onion likewise get a quick sautee, but the remaining ingredients just need to be tossed together with the hot pasta. Also in the foreground is the Sauce Americaine for the Lobster Rolls, waiting to go out along with the gnocci (we generally try to take out two dishes at a time).